“In 1991, 1994 and 2009 the parties continued negotiating past the strike deadline, and a settlement was reached without a strike. The same process at least should be tried this time,” said Bernick, who formerly served as a director of the BART transit system. I’m sure the people who use BART find this frustrating, as do the users of any public transit system. If you want to convince people to get out of their cars then you need to guarantee that the service will be running. In the case of BART people have been fortunate, but you can’t just leave it to the whim of unions. Sometimes there is nothing to say. Sometimes your day is just perfect. The weather is wonderful. You have a great breakfast at a favorite restaurant out in the country. You spend pleasant time with family. You get all kinds of things done. And the last thing you want to do is open a computer. Sometimes everything is just perfect and there is nothing else to say. Everyone should be so lucky. No it isn’t the end of the world. The sky isn’t really falling. I’ve already seen people trot out the obligatory “climate change” reference. Weather is local and short-term. If it snows in the town where you live next Tuesday, that’s weather.Climate is long-term and doesn’t relate to one small location. The climate of an area is the average weather conditions in a region over a long period of time. If the part of the world you live in has cold winters with lots of snow, that would be part of the climate for the region you live in. The winters there have been cold and snowy for as long as weather has been recorded, so we know generally what to expect. We’ve had bursts of torrential summer showers for as long as I’ve been alive. As kids we used to love to run around in them. You can clearly see from the picture that the parking lot has a huge valley. Cars at the edge are dry while cars in the valley are underwater. 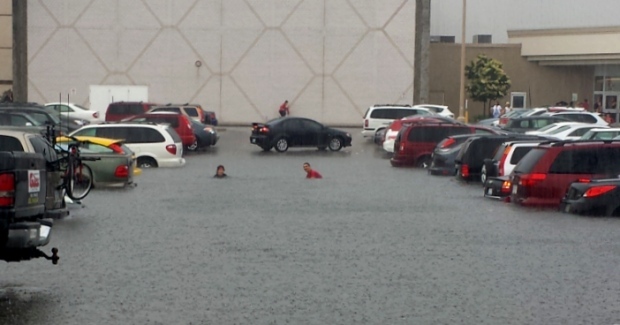 That’s just poor parking lot planning. I’m pretty sure we’ll survive. Though if the rain continues for forty days and forty nights, I may have to revise my opinion. Responsible professionals know that sick days are not an entitlement. They are there when needed, when we are just too sick to work. I’m rarely sick, but when I am I just work from home, perhaps a bit less effectively, but I still work. That’s because I know that others depend on me. Some people have far less flexibility when they are sick. Teachers with the Toronto District School Board took more sick days in May 2013 than that month the year before, with elementary teachers jumping 24 per per cent year over year, and high school teachers at 18 per cent. There appears to be a pattern to when teachers take those sick days, as numbers from the Peel District School Board show teachers taking more sick days on Mondays and Fridays. This affects their students, as well as hitting the school board budget directly, which will then result in something else being cut to balance the budget again. Some teachers feel entitled to their sick days, and they are going to take them regardless of the consequences. To me that sounds less like a responsible professional, and more like a spoiled child. The forecast this week was filled with rain, so I planted some grass seed. That was four days ago. I’m still waiting for the rain to come. Millions of dollars spent on equipment to forecast the weather as far as two weeks out, yet it’s generally more accurate to just look out the window. But I’m supposed to believe that these people can forecast the climate in 100 years. Until you can get tomorrow right, don’t bother guessing any further. The National Post doesn’t understand fail dealing. I have occasionally quoted from the National Post newspaper, but I think I’m going to stop because the seem not to understand the concept of Fair Dealing in Canadian copyright law. Now when you want to copy a piece of text from one of their article by right clicking, they prompt to ask you if you want to obtain a license. If you say no you can’t copy the text. I guess if you say yes then they let you. I won’t be saying yes, so it is a moot point. By the way Mr. National Post, the right click capture is easily defeated. I quote for research or review. I never copy more than a paragraph. I provide a link to the relevant article so that readers can read it themselves. I do not profit from the information – there are no ads on my blog. But if the National Post does not want me referring my readers to their content, that’s fine with me. There are plenty of other newspapers. Johnny can’t write. Cursively anyway. I learned to type when I was nine. I’ve been writing on a computer for more than 30 years. But I can tell you I would feel something vital had been lost if I could not express my thoughts longhand. Often when I am stuck at the keyboard, unable to find my way out of whatever mental cul-de-sac I have put myself in, I will pick up a pen and start writing — and the words start to come again. A signature is something that is uniquely ours. It is something we have created, that no one else can replicate (nefarious motives aside) in true likeness. An Internet password is none of those things. By neglecting to teach our children the value of cursive writing, with which they can create their own physical mark, are we setting them up to have their digital identities stolen, with no real, hard-copy ones to back them up? I never learned to print or write well in school years ago. My dad, a drafting teacher, taught me to print properly. I did learn to sign my name, though it isn’t entirely recognizable, but it is consistent. As a result of that and taking notes on paper throughout university, my “writing” is more like a flowing printed script. But I get his point. I work on my laptop every day, and I’ve been sitting in front of a computer typing for a living for over 30 years. I can write pretty well on the computer, but there is something about the look and the feel of putting pen to paper. The words seem to flow that much more easily. Sometimes the tools – like a computer and word processing software – get in the way of the words, and it becomes more about formatting the words than writing them. I always keep plenty of pens and paper around. And I enjoy writing, ink stained fingers and all. An unlike a computer, there is something freeing about being able to write in the margins, scribble out a word or two, and to be able to follow the path of where your thoughts have been on the way to where there are going. If your business model depends on forcing the people who provide your content to work for much less, how sustainable is your business model? We’ve heard Pandora complain it pays too much in royalties to make a profit. (Of course, we also watched Pandora raise $235 million in its IPO and double its listeners in the last two years.) But a business that exists to deliver music can’t really complain that its biggest cost is music. You don’t hear grocery stores complain they have to pay for the food they sell. Netflix pays more for movies than Pandora pays for music, but they aren’t running to Congress for a bailout. Everyone deserves the right to be paid a fair market rate for their work, regardless of what their work entails. The MusicTechPolicy blog has also noticed something curious. Since January, Westergren has been selling 85,000 Pandora shares, worth around $1m, every month. Given that he has some 2 million shares, if he keeps to his selling pattern, he will have cashed out fully in two years’ time. This is hardly a vote of confidence in the long-term viability of his business. Basically, he’s demanding that everyone else be forced to take a pay cut to make his business viable. But he has no interest in sharing the pain. The first major heat wave of the summer is expected to hit Waterloo Region Sunday and last until Tuesday. Environment Canada forecasts high temperatures and humidity for the region, reaching humidex values in the low 40s. Environment Canada shows an expected temperature of 31 degrees Celcius, or about 88 degrees Fahrenheit. But newspaper suggests that it will “feel like” 104 degrees or higher. There is no major body of water near Waterloo, so humidity is relative. I grew up about two miles from Lake Ontario. That was real humidity. Back then nobody told you what it “felt like”. It was just 88 degrees and sticky. We didn’t stop playing outside. We didn’t have air conditioning either. Yet we survived. Probably because we didn’t have people constantly telling us how terrible it was. But life was simpler back then. Heat and humidity aren’t new. They are just part of life in Southern Ontario. Yes it’s hot. Deal with it. I have a couple of shelves full of cookbooks. I guess you could say I like to cook a little bit. But I’ve never really cottoned to celebrity cookbooks (I always wanted to say “cottoned to” – I’m sure someone will appreciate it). That is, until yesterday. In the quest for a non-dairy, low sugar dessert, someone had recommended to my wife a Gwyneth Paltrow recipe for a frozen yogurt-ish dessert. 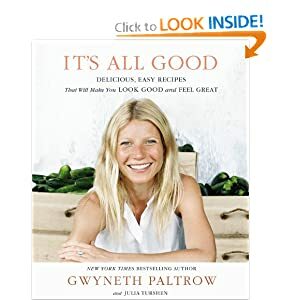 That led us after dinner – a pleasant evening on the patio at Beertown in Uptown Waterloo – to the bookstore, where we glanced through It’s All Good, a new cookbook by Ms. Paltrow. That quick look was interesting enough to convince us to buy the book. We made the Instant Berry + Coconut Sherbet (page 265) for dessert last night and it was delicious. And tonight was Millet “Falafel” with Avocado + Tomato Relish (page 203). Since I could not find millet I substituted bulgur wheat but it tasted pretty good anyway. So I have to say, despite initial reservations, I can wholeheartedly recommend Ms. Paltrow’s cookbook, especially if you are vegan (which we are not – dinner was a nice big beef burger last night). And no, I am not being paid for this endorsement. Though I am certainly open to the idea.